Oral stomatitis is one of the adverse events induced by 5-fluorouracil (5-FU). The healing effects of Irsogladine maleate (IM), a therapeutic agent for stomach ulcer, were examined on oral stomatitis with 5-FU. The oral stomatitis model in the cheek pouch were produced by submucosal injection of 25 μL of 10% acetic acid solution in male Syrian golden hamsters anesthetized with pentobarbital 30 mg/kg i.p. on day 2. 5-FU was injected at 60 mg/kg/day i.p. on days 4 and 2. In the IM application group, 0.2 mL of IM solution or vehicle was started from day 0 to the oral mucosa of the cheek pouch. Application of 1.2 mg/mL IM solution significantly reduced the areas of injury in 5-FU-untreated animals. Application of 1.2 mg/mL IM suspension in sodium carboxyethyl cellulose (CMC-Na) solution did not reduce the area of oral injury in this model, and no reduction was observed upon p.o. administration of 1.2 and 4.0 mg/mL IM solution. The areas of oral injury in 5-FU-treated animals were significantly larger than those in 5-FU-untreated animals. The period required for the area of oral injury to be reduced to 50% was about 4.9 and 3.9 days in the 5-FU-treated and untreated animals, respectively. Application of 4.0 mg/mL IM solution significantly reduced the area of injury in the 5-FU-treated animals. In addition, 4.0 mg/mL IM in a solution containing gum ghatti to increase viscosity and retention reduced the area of oral injury significantly. However, p.o. administration of 1.2 or 4.0 mg/mL IM in gum ghatti-containing solution had no reduction effects. These results suggest that application of IM reduces the area of oral injury in acetic acid-induced oral stomatitis developing under both 5-FU treated and untreated conditions. Among various agents for chemotherapy of malignant neoplasms, 5-fluorouracil (5-FU) has been widely employed since 1957 . However, 5-FU has side effects such as cell growth inhibition and cytotoxicity, thereby impacting on the quality of life (QOL) of patients. Oral stomatitis is one of the adverse events induced by 5-FU, occurring through direct cell injury and indirectly by decreased resistance to bacterial infections. It is reported that about 40% of patients receiving standard chemotherapy, and more than 90% of those receiving chemotherapy in combination with localized irradiation develop oral mucositis [2,3]. Serious oral stomatitis not only impairs oral food intake but also hinders verbal communication and disturbs sleep, as well as leading to secondary infections, thus increasing the mortality rate. Therefore, it is important to prevent and treat persistent oral stomatitis . Gargle formulations currently employed to prevent and treat oral stomatitis include allopurinol as eliminator of reactive oxygen species induced by chemotherapy , azulene sulfonic acid sodium as oral care , lidocaine hydrochloride as symptomatic treatments included in analgesics , sodium alginate  and sucralfate as mucosal protection . Those are not standardized as the stomatitis therapy treatments. Recently, Irsogladine maleate (IM) (Figure 1) has received attention as a drug that has healing effects on oral stomatitis , including that associated with rheumatoid disease and Bechet’s disease [10,11]. Figure 1: Chemical structure of IM. IM is also sold as a medicinal formulation, “Gaslon N®-OD”, for stomach ulcer, but is not approval for oral stomatitis. In the present study, to clarify the therapeutic effects of IM on oral stomatitis, occurring because of 5-FU treatment or no treatment, we (1) investigated its healing effects, (2) conducted pharmaceutical studies, and (3) evaluated differences in its therapeutic effects when administered via different routes. Male Syrian golden hamsters weighing 100 g to 150 g were purchased from Sankyo Labo Service Co. (Tokyo, Japan) and given free access to water and commercial food pellets (MF: Oriental Yeast Co. Tokyo, Japan). They were kept in a temperature (24°C ± 1°C) and humidity-(55% ± 5%) controlled room with a 12 h day-night cycle. All experiments were performed per the guidelines of the animal research committee of Toho university and Meiji pharmaceutical university. The oral stomatitis model was prepared by anesthetizing the hamsters with 30 mg/kg pentobarbital i.p. The center of the cheek pouch was then exteriorized and sandwiched between ring forceps 5 mm in inner diameter, followed by submucosal injection of 25 μL of 10% acetic acid solution through the ring forceps. The day of acetic acid injection was considered the day when oral stomatitis had been induced, and was defined as day -2 of IM application. 5-FU® 250 mg (50 mg/mL) was injected at 60 mg/kg/day i.p. on days -4 and -2. In the IM application group, 0.2 mL of IM solution or vehicle was applied on day 0 to the oral mucosa of the cheek pouch, and daily thereafter (Figure 2). For p.o. administration, 0.2 mL of IM solution or vehicle was administered directly into the stomach using an oral tube. All IM formulations were stored at 4°C in a dark place. In the control group, only vehicle was administered. Figure 2: Experimental protocol; Note: 5-FU: 5-Fluorouracil, IM: Irsogladine maleate. The area of oral injury was determined by measuring the major axis (a) and minor axis (b) of the lesion using a Shinwa Digital Caliper under pentobarbital anesthesia on days 0, 2, 5 and 8 in the 5-FU-untreated group and on days 0, 2, 5, 8 and 10 in the 5-FU-treated group, and calculated as an elliptic area (a × b × π/4). IM solution included IM 80 mg dissolved in refined water and 4 g of hydroxypropyl-β-cyclodextrin per 10 mL, and the sprays contained 5 g of gum Ghatti in IM solution. IM suspension was prepared 12 mg IM suspended in CMC-Na solution. Acetic acid, sodium carboxymethyl cellulose (CMC-Na) (Wako pure chemical industries, Ltd., Osaka, Japan), hydroxypropyl-β-cyclodextrin (Nihon Shokuhin Kako Co. Ltd., Tokyo, Japan), 5-FU® Injection 250 mg (50 mg/mL) (Kyowa Hakko Kirin Co., Ltd., Tokyo, Japan), Somunopentyl® (pentobarbital sodium salt 64.8 mg/mL) (Kyoritsu Seiyaku Co., Tokyo, Japan), and gum Ghatti (Sanei gen F.F.I., Inc., Osaka, Japan) were obtained commercially. All other chemicals used were of analytical grade. Numerical results are expressed as means ± SEM and statistical significance was calculated with two-way ANOVA for repeated measurements. Differences at P<0.05 were statistically significant. Healing effects of IM solution on acetic acid-induced oral stomatitis in 5-FU-untreated animals Although 0.4 mg/mL IM solution tended to reduce the area of oral injury in 5-FU-untreated animals, the difference in the reduction relative to IMuntreated animals was not significant. On days 2 and 5, the area of oral injury in the group treated with 1.2 mg/mL IM solution was reduced significantly relative to that in the control group treated with the vehicle (Figure 3A). 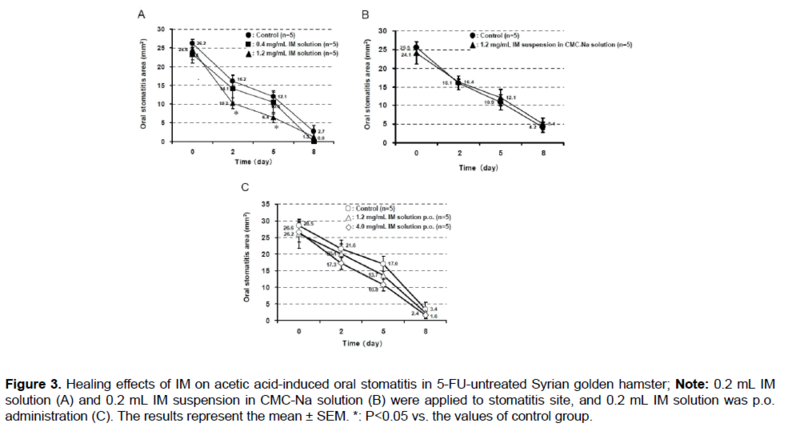 Figure 3: Healing effects of IM on acetic acid-induced oral stomatitis in 5-FU-untreated Syrian golden hamster; Note: 0.2 mL IM solution (A) and 0.2 mL IM suspension in CMC-Na solution (B) were applied to stomatitis site, and 0.2 mL IM solution was p.o. administration (C). The results represent the mean ± SEM. *: P<0.05 vs. the values of control group. On the other hand, the area of oral injury in the group treated with a 1.2 mg/mL IM suspension in CMC-Na solution was not significantly different from that in the control group treated with the CMC-Na solution alone (Figure 3B). Changes in oral injury resulting from p.o. administration of 1.2 and 4.0 mg/mL IM solution did not differ significantly from those in the control group administered IM solution p.o. (Figure 3C). Healing effects of IM on acetic acid-induced oral stomatitis in 5-FU-treated animals. The area of oral injury in 5-FUtreated animals was significantly greater than that in 5-FU-untreated animals. The period required for the area of injury to be reduced to 50% was about 4.9 and 3.9 days in the 5-FU-treated and -untreated animals, respectively (Figure 4A). Figure 4: Healing effects of IM on acetic acid-induced oral stomatitis in 5-FU-treated Syrian golden hamster; A) In 5-FU-treated animals, 0.2 mL IM solution; B) and 0.2 mL IM gum ghatti-containing solution; C) were applied to oral stomatitis site, and 0.2 mL IM gum ghatti-containing solutions was p.o. administration; D) 60 mg/kg 5-FU i.p. was administrated -4 and -2 day before IM application or administration. The results represent the mean±SEM. *: P<0.05 vs. the values of control group. Application of 4.0 mg/mL IM solution significantly reduced the area of acetic acid-induced injury in 5-FU-treated animals (Figure 4B). In addition, 4.0 mg/mL IM dissolved in gum ghatti solution to increase viscosity and retention significantly reduced the area of oral injury (Figure 4C). However, p.o. administration of 1.2 or 4.0 mg/mL IM in gum ghatti solution had no lesion-reducing effects (Figure 4D). The present study showed that a solubilized solution formula of 1.2 mg/mL IM had healing effects on oral stomatitis in 5-FU-untreated Syrian golden hamsters, whereas the therapeutic effects of an IM suspension in CMC-Na solution were less potent. Application of 4.0 mg/mL IM "solution formula" showed accelerated healing effects on acetic acid-induced oral stomatitis in 5-FU-treated animals, and exerted an effect as a "gum ghatti-containing formula". Application of 0.4 mg/mL IM solution had no therapeutic effect on acetic acid-induced oral stomatitis in 5-FU-untreated hamsters, whereas the 1.2 mg/mL IM "solution formula" did show significant therapeutic effects on days 2 and 5. These results suggest that IM solution has therapeutics effects on oral stomatitis when administered at doses of more than 1.2 mg/mL. No significant healing effects of a 1.2 mg/mL IM suspension in CMC-Na solution were observed relative to those of an IM suspension in CMC-Na solution, suggesting that IM needs to be solubilized in "solution formula" to exert therapeutic efficacy. Although no healing effects on oral stomatitis were observed for p.o. administration of 1.2 mg/mL and 4.0 mg/mL IM, there was a tendency for lesion recovery, suggesting that higher IM doses administered p.o. might have healing efficacy. On the other hand, the area of oral injury was significantly decreased by application of 4.0 mg/mL IM "solution formula" and "gum ghatti-containing formula" in comparison with the untreated control. Thus, it is suggested that IM solution with a concentration exceeding 4.0 mg/mL would have therapeutic effects on oral stomatitis in 5-FUtreated animals. In the present study, it was suggested that IM had concentration-dependent healing efficacy against oral stomatitis in this model, and that further experiments to determine the optimal concentration at more than 4.0 mg/mL IM will be necessary in the future. Both the 4.0 mg/mL IM "solution formula" and "gum Ghatti-containing formula" exerted therapeutic effects, and there was a significant difference in the area of oral injury in the groups with and without IM application on days 5 and 8. As a formula with high viscosity due to addition of gum Ghatti ensures a longer-lasting IM retention time in oral stomatitis cavities, we suspect that the healing efficacy of IM "gum ghatti-containing formula" would be stronger than that of the usual “solution formula”. However, the therapeutic efficacy of the IM "gum Ghatti-containing formula" was similar, and the period until its therapeutic efficacy appeared tended to be delayed in comparison with the IM “solution formula”. Gum ghatti is a type of polysaccharide, and it has been reported to support bacterial growth , suggesting possible proliferation of bacteria in the “gum Ghatti-containing formula”. As patients receiving chemotherapy for cancer are sometimes immunocompromised due to treatment with anticancer drugs, the use of the “gum Ghatti-containing formula” for such patients would increase the risk of infection, and therefore its clinical application would have to be considered carefully. However, about oral stomatitis induced by a combination of both chemotherapy and radiotherapy, the radiation therapy protocol generally lasts 6-7 weeks , and therefore application of a drug to diminish the area of oral injury at an early stage is important for maintenance of QOL in such patients. In the present study, both the IM “solution formula” and “gum Ghatti-containing formula” were effective for therapy of oral stomatitis by buccal application. Hereafter, it will be necessary to confirm the pharmaceutical stability of IM formulas employed for oral stomatitis therapy. Although IM in solution is stable to heat at mildly acidic-neutral-weak alkaline pH, and is also stable to light at neutral pH , stability testing of IM-containing formulas will be necessary. In the present study, the IM suspension in CMC-Na solution did not exert any therapeutic effects, suggesting that an IM OD tablet suspended in CMC-Na solution might not be therapeutically effective for oral stomatitis. Ideally, therefore, the IM formula should not be a suspension, but a solution. If an IM suspension in CMC-Na solution has therapeutic effectiveness against oral stomatitis, then the IM OD tablet would be a useful IM formula. Although further study of the stability of the IM formula will be necessary, this study has demonstrated the effectiveness of the IM formula for oral stomatitis, suggesting that it could become useful for patients receiving chemotherapy. For the future, practical use of the IM formula, we think that pharmaceutical testing would be justified. Heidelberger C, et al. Fluorinated pyrimidines, a new class of tumor-inhibitory compounds. Nature 1957;179:663-666. Berger AM and Kilroy TJ. Oral complications: Principles and practice of oncology. In: DeVita VJ Jr, Hellmen S, Rosenberg SA (Eds), (5thedn), Lippincott Raven, Philadelphia, PA. 1997;2714. Wilkes JD. Prevention and treatment of oral mucositis following cancer therapy. Semin Oncol. 1998;25:538-551. Nomura M, et al. Irsogladine maleate reduces the incidence of fluorouracil-based chemotherapy-induced oral mucositis. Ann Oncol. 2013;24:1062-1066. Greenberg B, et al. Neoadjuvant therapy for advanced head and neck cancer with allopurinol modulated high dose 5-fluorouracil and cisplatin. A phase I-II study. Cancer 1987;59:1860-1865. Watanabe T, et al. Polaprezinc prevents oral mucositis associated with radio chemotherapy in patients with head and neck cancer. Int J Cancer. 2010;127:1984-1990. Yamamura K, et al. Oral mucosal adhesive film containing local anesthetics: in vitro and clinical evaluation. J Biomed Mater Res. 1998;43:313-317. Oshitani T, et al. Clinical evaluation of sodium alginate on oral mucositis associated with radiotherapy. Nihon Gan Chiryo Gakkai Shi. 1990;25:1129-1137. Carter DL, et al. Double blind randomized trial of sucralfate vs placebo during radical radiotherapy for head and neck cancers. Head Neck. 1999;21:760-766. Yoshida T and Hirakata M. Therapeutic benefits of irsogladine maleate on aphthous stomatitis induced by methotrexate in rheumatoid arthritis. J Rheumatol. 2003;30:2082-2083. Nanke Y, et al. Irsogladine is effective for recurrent oral ulcers in patients with Bechet’s disease: an open-label, single-centre study. Drugs RD. 2008;9:455-459. Takeuchi H, et al. Determination of contaminant microorganisms in food hydrocolloids: Comparison between the agar plate assay and the ATP bioluminescence assay. Jpn J Food Chem. 1997;4:48-53. Gussgard AM, et al. Symptoms reported by head and neck cancer patients during radiotherapy and association with mucosal ulceration site and size: An observational study. PLoS One. 2015;10:e0129001. Ueno M, et al. Physico-chemical properties and stability of 2,4-diamino-6-(2,5-dichlorophenyl)-s-triazine maleate (MN-1695). Iyakuhinkenkyu. 1986;17:1170-1180.